Late one Sunday after a weekend away, we came home to an empty fridge with a strong craving for Indian food. I was wishing for an Indian version of Ina Garten who would load up my fridge with a proper Indian meal before my return. If there’s anyone out there interested in filling that role, I live in a lovely building in Dumbo and can tell you more about it. I dove into the freezer and resurfaced with a box of peas. I scrounged up some mushrooms, a tomato and an onion. Within 15 or 20 minutes, I cobbled together a simple dish of curried mushrooms and peas with frozen naan. It reminded me that fresh, healthy and Indian doesn’t mean hours spent slaving over the stove. It also doesn’t require a spice cabinet stacked three rows deep (all of the spices used here are on my top ten list of Indian spices). I sometimes make a “wet” version of this curry which is more time consuming. This version is more like the weeknight version. It’s tasty without all of the fuss of slow cooking the masala. Heat about a tablespoon of oil in a saucepan. Add the mushrooms and cook on medium heat for about 10 minutes, stirring frequently, until the mushrooms are soft and glossy looking. In a wide skillet, cook the onions for about 10 minutes until see through then add the tomatoes and spices. Cook for about another 5 minutes until the tomatoes have wilted. Add the peas and mushrooms. Cover and cook for another 5 to 10 minutes. Turn off the heat and stir in the yogurt. Serve warm with roti or naan and rice. I wish I had a desi version of Ina as my friend too. Well.. since we don’t have one, we should start cracking those eggs & scrounging for those lonely last veggies in the fridge. Curry looks yummm..
Mmmmmm… Saw this today and showed my mom (who is briefly staying with us as part-nanny, part-cook). She quickly whipped up her own version (added tomato paste, crushed tomatoes with liquid, no yogurt) and wrapped it in tortillas (no naan on hand). Delicious!! @Meera Diaz – Part-time nanny, part-time cook Mom sounds great! It’s how I got through my first few weeks of being a mom. Sounds like a great variation. @justcooknyc – Mushrooms in Indian food are great. Morels are actually pretty common in the Kashmiri region and are used to make a curry. Mushrooms and spinach (aka palak paneer but w/mushrooms instead of spinach) is common as well. It’s actually really great if you’re trying to be healthy or veganize a paneer dish (assuming you also omit the yogurt). Peas and mushrooms are such a classic combination. This looks like an easy-to-put-together yet delicious recipe, Nithya. Hope you and the baby are doing well. 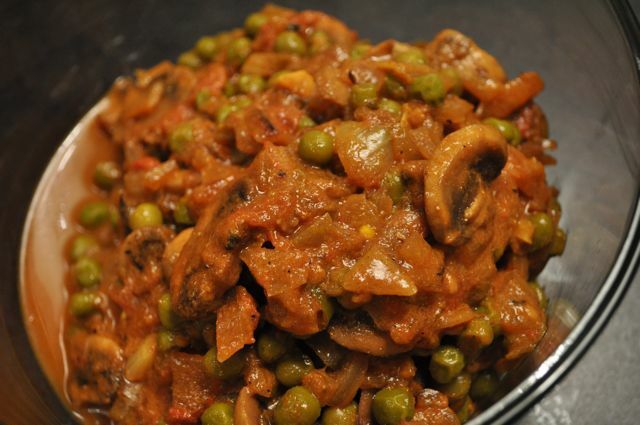 Try This Spicy Matar (Peas) – Mushroom Recipe! You Will Not Forget The Taste!